DRIVE along the main road west of Tarifa – or up by the Trafalgar lighthouse, near Vejer – and on a windy day, you will be for a real treat. Like a day out in rural China, you will see dozens – sometimes hundreds – of large colourful kites bobbing up and down and weaving around in the prevailing winds. Zoom in and you will soon realise that practically the whole of the stunning dunebacked Valdevaqueros beach is dominated by the high adrenelin sport of kitesurfing. It has literally taken the area by storm and over the last decade the traditional sport of windsurfing has been massively blown out by this fashionable sport. To keep up with the craze over 50 schools cater for tourists who want to buy or rent equipment. The best include Hot Stick, run by friendly Tilo, and Etik kiteschool, run out of the famous O’Neil shop in the heart of Tarifa. “It has certainly become one of the key economic dynamos of the town and brings in a lot of money,” explains Julian, from Etik. The progression in the sport is fast, but it is important to take lessons and get the right introduction into safety systems. Otherwise it can be dangerous. A standard kite course is about three to four days, after that you will be able to practise on your own. Famed as ‘the Wind Capital’ of Europe, it is unsurprising that Tarifa’s Valdevaqueros Beach occasionally hosts the World Championships. Alongside Diamond Head in Hawaii and Fuertaventura in the Canaries, there are no other places that rival it for constant winds, either the Poniente from the west or the Levante from the east. The best wind for kitesurfing is the Poniente, which comes in from Portugal. It measures between two and five on the Beaufort scale and brings in a cooler breeze from the sea. 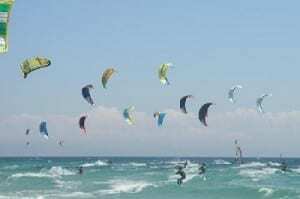 It also happens to be the dominating wind in Tarifa. The best wind for windsurfers is the Levante, which comes from the south-east from Africa. It normally builds up for a few days and at its peak – when everyone gets sent mad – it can reach up to eight or nine on the Beaufort scale. A variety of other companies organise activities in the area, including Yellow Sub, which organises a variety of diving trips around the straits. There are dives out to numerous wrecks in the area and, as the area is now a protected natural park, divers are bound to see numerous fish and sometimes dolphins. Among the best things to spot are moray eels, octupus and scorpion fish. The visibility is always good and the temperatures stay at between 15 and 20 degrees. “We get a lot of people coming up from the Costa del Sol as we have the best diving around,” says Italian Enrico Demelas from Yellow Sub.